When you want to visit Canada as a foreigner, you will need a passport and depending on where you’re from, you will also need a visa. Without proper identification, you will not be able enter Canada. Canada has it’s own Electronic Travel Authorization system. 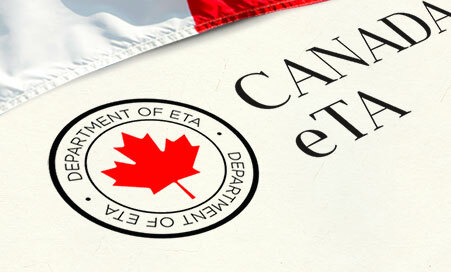 The Government of Canada’s official website to apply for an eTA. It’s a very cheap way of obtaining a travel authorization. Most eTA applications are approved within minutes after applying. However, we recommend that you apply at least 72 hours before departure just to be sure. When applying for an eTA or any other Canadian visa, make sure that your passport will be valid at least until after you leave Canada. It’s possible to apply for a visitor’s visa online or via paper fairly easily. When applying online, all you need is a scanner o create electronic copies of the documents you upload and a valid credit card to pay with. Canada uses GCKey. A GCKey lets you securely access the Government of Canada’s online services. It includes a username and password that you choose. You also must create security questions. This keeps your data secure and lets you recover your account. When you want to apply for a Canadian visa and want to stay in Canada for longer than three months, we recommend that your passport is valid for at least two more years. If your passport is about to expire, it might make it harder for you to enter the country. Children under the age of 18 are considered minors in Canada. They must follow the same rules to enter Canada as any other visitor. Minors who try to enter Canada without the proper documents, or who are with adults other than their parents or legal guardian(s), will be checked more closely. If their documents are not sufficient, they can be denied entry just like any other visitor. Border services officers are on alert for children who need protection and check very carefully for missing or runaway children. They may question you about children who come with you to Canada or question a child who travels alone. Make sure you have the proper documents with you.